Sunday mornings are always a rush for me. No matter how early I wake up, we still end up arriving at the church late…. shame on me! Something always crops up on Sunday mornings…. either Alycia or Sherilyn will puke during breakfast, either one of the gals will have a temper tantrum and refuse to cooperate with me or daddy will wake up late! Must be the work of the devil!! However, on some Sunday mornings, daddy will wake up early and help me with the gals. 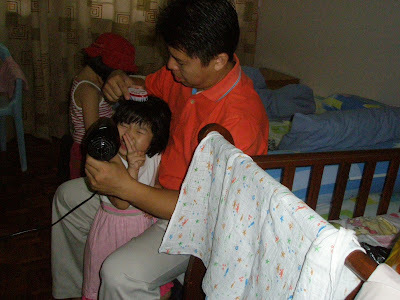 After I had showered Alycia and Sherilyn, he will dress them up and blow dry their hair…. saloon style and the gals just love it…. as seen in the pix here. If only daddy would help me with the gals more often, life would be more peaceful for me. It’s really no joke having to manage 2 hyperactive toddlers and a 2-month old baby all by yourself. It’s back-breaking, heart-breaking (when the 2 older gals refuse to listen to what I say), blood boiling and now I even have dizzy spells when Sherilyn (my super tough nut) rebels against me! Haha……i always hear this comment from parents……”No matter how early I wake up, we still end up arriving at the church late”…. guess that will happen to us soon……..=P As it is now, we are already sometimes late as we dun have to teach SS anymore. I am sure the gals enjoy their “daddy-daughter” sessions…………..Sher looks like she is enjoying herself. Hehe.. at least he helps out once in a while… my hubs almost never help me out… at least none that I could recall. So sweet to see Daddy is helping with the gals ya! And that is his 3 Charlie’s Angels …..
How about asking daddy to blow dry your hair salon style too. Haha. ya, i believe all the “hindrances” were making by devil. Hehe..your hub likes to blow-dry their hair the salon style too, eh? My hub does that for Belle too. As for me, I just simply blow-dry her hair..with hair flying all over her head. As long as it is dry, kan? LOL! So nice of daddy. I have to show these pics to my husband so he can learn a thing or 2 ….hehhehhhee. 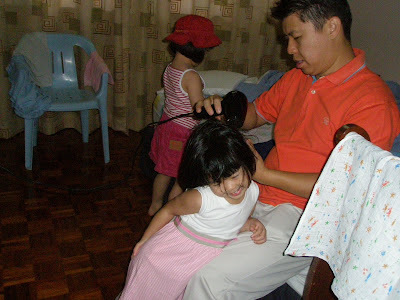 daddy so nice, my hubby even don’t know how to comb her daughter’s hair, ha! yeah, having hyperactive kids are terrible, like mine, everyday I shout from morning till night. hahaha…me too…always late for church no matter how early we wake up. 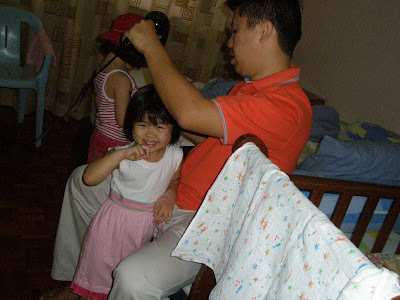 the only time when we were early for church when hubby was working full time in church. we have to be there one hour before service starts!